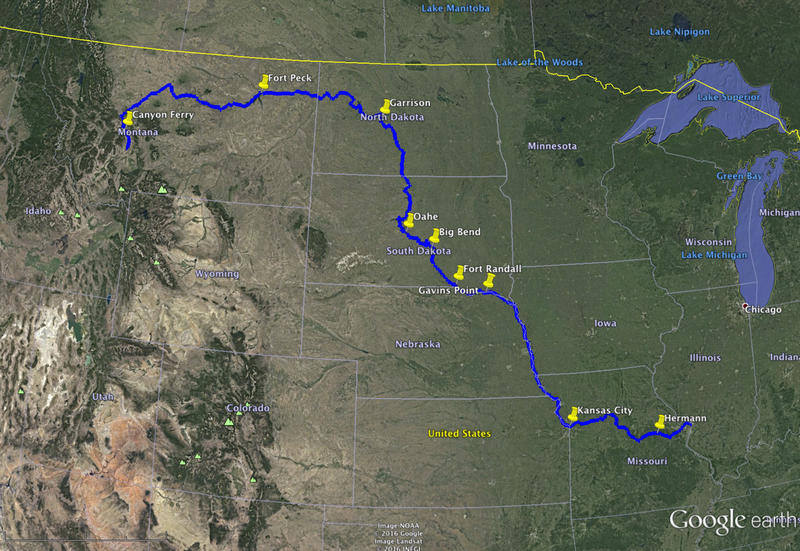 The last time I looked at water flow on the Missouri River was 2013; it’s time for an update. 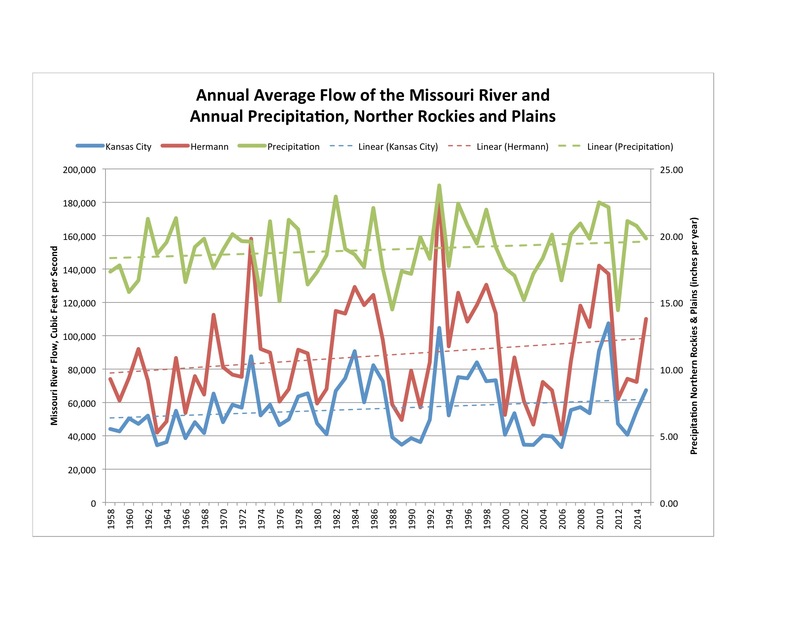 Water flow on the Missouri is an important question. Floods on the river have cost untold millions of dollars of damage over the years, it is the source of drinking water for more than half of Missouri’s population, including the cities of St. Joseph, Kansas City, Columbia, and St. Louis, it is used for irrigation, and it is used as a an artery for the shipment of food and other commodities. Figure 1. Dams Along the Missouri River. Source: Google Earth. Missouri is downstream from 15 dams on the mainstem of the Missouri River, and more on tributary rivers. One of the most important functions of these dams is to regulate the flow of the river, holding back water during times of flood and releasing reserved water during times of drought. As you go up river, the most important dams are the Gavins Point Dam (1957), the Fort Randall Dam (1956), the Big Bend Dam (1966), the Oahe Dam (1962), the Garrison Dam (1953), the Fort Peck Dam (1940), and the Canyon Ferry Dam (1954). All but Gavins Point impound more than a million acre-feet of water. The flow of the river is so important that conflict has arisen between upstream states, which want enough water conserved in their reservoirs for drinking and farming, and downstream states, which want enough water released to keep navigation systems open. Throw into this mix the environmentalists, who want to return the river to its natural state as much as possible to support important species and the riverine ecosystem. The United States Geological Survey maintains stations for monitoring our nation’s surface water, including gauges along important rivers. The gauge in Kansas City and the gauge in Hermann both record the annual average discharge of the river at their respective locations going back to 1958 (See Figure 1). Though not perfect, the Kansas City gauge can give a rough estimate of the flow of the Missouri River entering the state. After passing Kansas City, several important tributaries enter the Missouri, including the Gasconade River, the Grand River, and the Osage River. The Hermann gauge can give an estimate of the flow after all of the major tributaries in the state have added their water to the total. Figure 2. Data sources: United States Geological Survey, National Centers for Environmental Information. Figure 2 shows the average flow of the Missouri River in cubic feet per second, with Kansas City in blue and Hermann in red, and the scale against which you should read them is on the left. The third line, in green, is the annual precipitation in the Northern Rockies and Plains climate region, the approximate drainage basin of the Missouri River. Its scale is shown on the right, in inches of precipitation per year. I also had Excel calculate linear regression trend lines on all 3 series, and these are shown as dashed lines. In the interest of full disclosure, be sure to notice that the final data point in all 3 series represents only 7 years, not 10. First, the flow at Herman is higher than at Kansas City. This is expected, because several tributaries add their flow to the river between Kansas City and Hermann. Second, the trend for each series is slowly rising. With the severe droughts of recent years, this seems surprising. Third, the variation in flow over time is very large, and the yearly variation dwarfs the change in the trend over time. At Hermann, the average yearly variation is 30% of the average streamflow. In fact, at Hermann, the highest annual streamflow (1993) was more than 4 times the lowest (2006). Fourth, periods of high and low flow can last for five or more years. Fifth, as I have noted in posts on climate change, the annual precipitation in the Northern Rockies & Plains also seems to be slowly increasing. Just “eyeballing” the chart, the variation in streamflow between years seems to have increased over time, and so does the variation in precipitation. As noted above, the years of both the highest and lowest streamflows have occurred since 1990. If streamflow variation is, indeed, increasing, it opens both the potential for increased flooding and problems due to low water. I will look at this question in more detail in the next post. For river flow: United States Geological Service. National Water Information System: Web Interface. USGS Surface-Water Annual Statistics for Missouri. This is a data portal. Working your way through this data portal is tricky and complex. The sites used above are sites 06893000 (Kansas City) and 06934500 (Hermann). The parameter used was Discharge (sometimes called streamflow) in cubic feet per second. The dates used were 1958-2015. Data was downloaded 6/8/16, and the starting point for the data portal was at http://waterdata.usgs.gov/mo/nwis/annual/?referred_module=sw. For precipitation: National Centers for Environmental Information. Climate at a Glace. This is a data portal. I selected Parameter: Precipitation, Time Scale: Year-to-Date, Month: Annual, Start Year: 1958, End Year: 2015, State/Region: Northern Rockies and Plains, and Climate Division/City: Entire Region. Data downloaded 7/9/16 from http://www.ncdc.noaa.gov/cag/time-series/us. By mogreenstats in Other Water, Water on 2016/08/04 .